The Federal Commission on School Safety's final report includes grant funding, information and research through the Office of Justice Programs as important ways to help states and local communities implement initiatives that protect their students, teachers and staff members. The report highlights, among other products, OJP's toolkits on police-mental health collaboration and helping victims of mass violence; research on indicators of school crime and safety; and a guide on preventing school-based bullying with related research. Its findings highlight the central role that state and local agencies can and should play in protecting students and ensuring that the academic environment is conducive to learning. In the report's letter to President Trump, the commissioners write, "There is no universal school safety plan that will work for every school across the country. Such a prescriptive approach by the federal government would be inappropriate, imprudent and ineffective." To tailor efforts to the specific needs of individual states and communities, the report recommends they use readily available resources and programs, and emphasizes the need for federal offices to share "ideas that are already working for communities across the country." For example, schools frequently deal with bullying and isolation – problems experienced by many who eventually became school shooters. 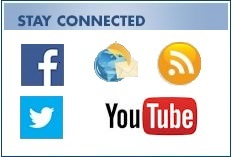 The website www.StopBullying.gov, sponsored by the U.S. Department of Health and Human Services, provides an online course on bullying prevention at no cost, and the U.S. Department of Education's Office of Safe and Healthy Students offers information on grants as well as other guidance. The report's recommendations range from assisting schools in developing positive climates and feelings of connectedness to encouraging training for those who work with children to recognize signs and symptoms of mental illness. 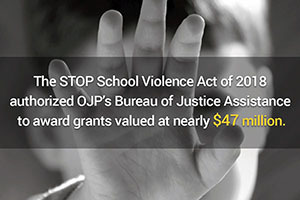 The commission underscored funds available through the STOP School Violence Act of 2018, a centerpiece of the Trump Administration's response, which provides funding for evidence-based programs to states, units of local government and federally recognized Indian tribes. The act authorized nearly $47 million for grants from OJP's Bureau of Justice Assistance last fall, as well as $25 million through the Office of Community Oriented Policing Services. President Trump established the Federal Commission on School Safety following the tragic February 14, 2018, school shooting in Parkland, Florida, that left 17 people dead. Secretary of Education Betsy DeVos served as chair and Homeland Security Secretary Kirstjen Nielsen, Health and Human Services Secretary Alex Azar II and then-Acting Attorney General Matthew Whitaker were members. Their work included field visits, listening sessions and meetings focused on identifying solutions. In the report, the commission provides a thorough blueprint for preventing, protecting from and mitigating violent incidents in our schools—a goal that requires the involvement of all Americans. "Ultimately, ensuring the safety of our children begins within ourselves, at the kitchen table, in houses of worship, and in community centers," the commission's letter to President Trump says. "The recommendations within this report do not and cannot supplant the role families have in our culture and in the lives of children. Our country's moral fabric needs more threads of love, empathy, and connection."